October is Women’s History Month, and so we’ve decided to feature Expulsion & Other Stories by Marina Sonkina. Expulsion & Other Stories consists of two parts, “a novella followed by a group of short stories. But the main protagonists have one thing in common: they are all women coming of age in difficult times”. Sonkina’s stories reach from post-Stalinist Russia to present-day Vancouver, each telling a different fable of women surviving against indomitable obstacles. The novella that begins Expulsion & Other Stories tells the story of a woman with secret powers, whose face is veiled for mysterious reasons. This image haunts Sonkina’s stories, which each focuses on a different woman whose identity is hidden by their history, by sociopolitical forces, or by the men in their lives. “A Room Between the Two Gogols” describes an abusive relationship that takes place in the poverty of post-Stalinist Russia, between a man called Andrey and a woman who is only referred to as “Andrey’s girl”. In one passage the narrator asks, “Was it after that second episode that he stopped using the girl’s name? Or had he avoided it even before that? She tried to catch him out, to make him use it. How else could he call her if he needed something? But all she noticed was that empty place, that void affixed to her being. It preceded her into the room before and remained, wrapping itself around her wherever she sat”. “A Room Between the Two Gogols” describes how difficult it is to negotiate the domestic responsibilities of women in a patriarchal culture, while foregrounding the “void” that is fixed to women in this role. Sonkina’s stories suggest that this void can be reclaimed, not as an emptiness, but as a source of possibility: as Andrey’s girl states, “She would be free again, an unladen vessel. She would harden her heart and not tell him what she was going to do to punish them both”. Sonkina’s stories focus on women, but her stories are full of commentary on masculinity. Men play an important role in the lives of each of these women, as family members, lovers, or authority figures. Dasha’s search for a brother in “If a Tree Falls in a Solitary Forest”, which resonates with Alexandra’s inferiority to her deceased brother in “Expulsion”, show how sibling relationships are structured by issues of gender. Men are also lovers, who help or harm the women they love. The narrator of “Hands”, who falls in love with the mysterious Erin, eventually becomes her John the Baptist whereas the Gypsy man in “Expulsion” seduces the young Alexandra into a relationship of abuse and exploitation. In each of these stories, the face of authority is always a masculine one – vividly reinforced in “The Squalor of Irresponsibility” by the dominating and lascivious school director Myrosyan. Most importantly, Sonkina’s stories are about survival, and overcoming struggles that many readers will relate to. This central theme is not specific to the Soviet context that frames most of the stories in her collection, as Sonkina explains in her introduction, “just as everywhere else, there were cads and cowards, bureaucrats and secret sadists, against whose grim moral background the small acts of kindness and grace and mercy shone with a brighter, more treasured light”. Expulsion & Other Stories is a reflective and transporting read for this Women’s History Month, which tells the stories of very different women facing similar oppositions against political strife and patriarchy. Marina Sonkina was born in Moscow, where she taught literature and linguistics at Moscow State University until she escaped from the Soviet Union. She has lived in Toronto and Montreal where she worked as a CBC producer and broadcaster, documentary film researcher and translator. She now lives in Vancouver, where she teaches at Simon Fraser University and the University of British Columbia. Marina Sonkina still finds time for writing, and has published two children’s books and two collections of short stories, including Lucia’s Eyes and Other Stories released by Guernica Editions in 2011. 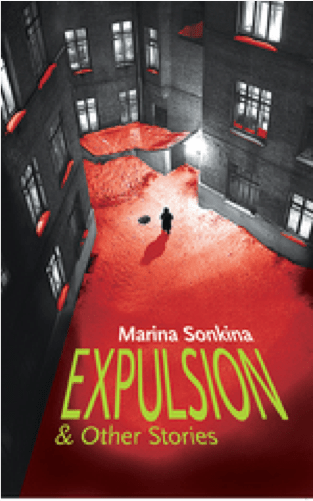 Tagged with Book of the Month, Expulsion & Other Stories, Marina Sonkina.